Cold air tends to fall, because it is denser than warm air, and collects at the bottom of slopes such as in valleys. Frost pockets occur where cold air collects; plants in such areas are more likely to experience frosts than those on similar land around them. This is why orchards, where blossom is vulnerable to frost damage, are established on the slopes away from the valley floor. Cold air can also collect in hollows on the way down slopes. It can also develop as a result of barriers, such as walls and solid fences, placed across the slope (see Figure 2.10). Figure 2.10 The creation of frost pockets: (a) natural hollows on the sides of valleys. (b) effect of solid barriers preventing the drainage of cold air. Permeable barriers, such as trees making up shelterbelts, are less of a problem as the cold air is able to leak through. Frost susceptible plants grown where there is good air drainage may well experience a considerably longer growing season. Gardens on slopes can be modified to advantage by having a low-permeable hedge above (a woodland is even better) and a very permeable one on the lower boundary. The features of the immediate surroundings of the plant can further modify the local climate to create the precise conditions experienced by the plant. This is known as its microclimate. The significant factors that affect plants include proximity to a body of water or other heat stores, shelter or exposure, shade, altitude, aspect and air drainage. The modifications for improvement, such as barriers reducing the effect of wind, or making worse, such as barriers causing frost pockets, can be natural or artificial. The microclimate can vary over very small distances. Gardeners will be familiar with the differences across their garden from the cool, shady areas to the hot, sunny positions and the implications this has in terms of the choice of plants and their management. Growers improve the microclimate of plants when they establish windbreaks, darken the soil, wrap tender plants in straw, etc. 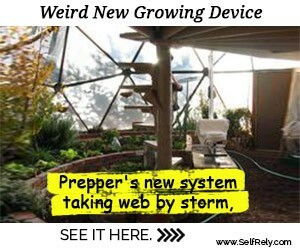 More elaborate attempts involve the use of fleece, cold frames, cloches, polytunnels, glasshouses and conservatories. Automatically controlled, fully equipped greenhouses with irrigation, heating, ventilation fans, supplementary lighting and carbon dioxide are extreme examples of an attempt to create the ideal microclimate for plants. Heat stores are materials such as water and brickwork, which collect heat energy and then release it to the immediate environment that would otherwise experience more severe drops in temperature. Gardeners can make good use of brick walls to extend the growing season and to grow plants that would otherwise be vulnerable to low temperatures. Water can also be used to prevent frost damage when sprayed on to fruit trees. It protects the blossom because of its latent heat; the energy that has to be removed from the water at 0°C to turn it to ice. This effect is considerable, and until the water on the surface has frozen, the plant tissues below are protected from freezing. Shelter that reduces the effect of wind comes in many different forms. 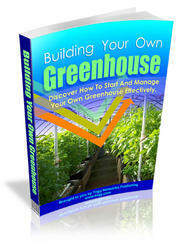 Plants that are grown in groups, or stands, experience different conditions from those that stand alone. As well as the self-sheltering from the effect of wind, the grouped plants also tend to retain a moister atmosphere, which can be an advantage but can also create conditions conducive to pest and disease attack. Walls, fences, hedges and the introduction of shelterbelts also moderate winds, but there are some important differences in the effect they have. The reduction in flow downwind depends on the height of the barrier although there is a smaller but significant effect on the windward side (see Figure 2.11). The diagram also shows how turbulence can be created in the lee of the barrier, which can lead to plants being damaged by down forces. Solid materials such as brick and wooden fences create the most turbulence. In contrast, hedges and meshes filter the wind; the best effect comes from those with equal gap to solid presented to the wind. However, the introduction of a shelterbelt can bring problems if it holds back cold air to create a frost pocket (see p36). 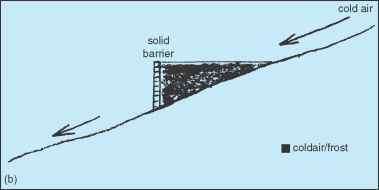 Figure 2.11 The effect of windbreaks: (a) solid barriers tend to create eddies to windward and, more extensively, to leeward, (b) a permeable barrier tends to filter the air and reduce its speed without setting up eddies. Shade reduces the radiation that the plant and its surroundings receive. This tends to produce a cooler, moister environment in which some species thrive (see ecology p48). This should be taken into account when selecting plants for different positions outside in gardens. The grower will deliberately introduce shading on propagation units or on greenhouses in summer to prevent plants being exposed to high temperatures and to reduce water losses.